Hi - we're Andrew and Toni, a professional couple just in our 50's who have decided to quit formal working for the foreseeable future, and travel through Europe to experience different cultures. We love seeing and experiencing daily life in different places, and are both very much outdoor and farm lovers (Andrew grew up on a fruit farm in South Africa). We both grew up with animals, and we have had cats and dogs, as well as the odd gerbil, rat and even chickens throughout our married life. In fact, our daughter is a final year vet student in London, so animals have always been an integral part of who we are. Whilst we are originally from South Africa, we have been living and working in the UK (and are British citizens) for the last 13 years. 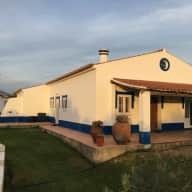 We are currently travelling in our motorhome in Portugal, and are therefore very flexible with regard to any opportunities for house-sitting in either Spain, Portugal or France. 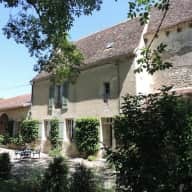 Part of the reason for our travelling, is to find out much more about the countries and people Europe, and we believe that doing house-sitting would give us a more immersive experience. As animal lovers, one thing that we really find ourselves missing is having pets around us to keep us company on walks and around the house, especially during these winter months. We really miss playing and cuddling with animals, and would therefore love to combine a house-sitting experience with caring for the family pets - a perfect opportunity! 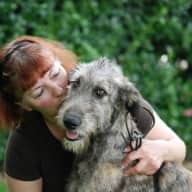 We have recently successfully completed our first house sit in Portugal which included caring for 9 pedigree French Bulldogs (2 pregnant) and two pedigree Irish Wolfhounds (1 pregnant) for two weeks. The house we looked after is off-grid so we needed to manage the power and water requirements which was also a good experience. We have also had a lot of experience successfully caring for our own, and sometimes friends' and family's pets. At one stage Andrew was even working on a fish farm and helping look after cattle, which, as a farmer's son, he loved. We are a good match, as Andrew is an ardent dog lover whilst Toni is definitely a cat lover, but we really do like all animals, even our chickens were all duly named and petted! We have owned and rented many homes during our married life, and are both very handy around the house. We have completed numerous renovation projects and are both very practical, so can solve almost any issues in a house that may arise. We believe that is a big strength that we as a couple bring to any house-sitting opportunity. We also both really love gardening and pottering about the house - we are essentially homebodies. We are both non-smokers, keen mountain-bikers and walkers and enjoy bird-watching and being out of doors. It was so lovely to meet Andrew and Toni and been with them 1 day before I left. They are lovely, friendly and efficient people who are absolutely worthy of a 5* rating. The dogs were super well treated, and it was noted how much they liked them. The house was left beautifully tidy with everything put away in its original place. We arrived early in the morning and the space of the dogs was already all clean. Toni wanted to cook the lunch and we all had a great lunch together before they left. I am hopeful that we will be lucky enough to be able to use them again for our trips in the future. It was such a lovely experience spending time with you and your family, and we loved your house and especially the dogs; we miss them a lot. We felt so welcome in your home and know that we have made very good friends, we hope to return soon. Toni and Andrew are the perfect couple to entrust your home and pets to - they are a mature couple who have an inherent love for animals which has manifested in their daughter studying to become a vet. I believe that they will look after your home as though it was their own - they are very neat and organised and their own home was always sparkly clean and tidy. They are homebodies, so will be around for your pets when they need them and having grown up with animals and on a farm (in Andrew's case), they are knowledgable and comfortable around just about any animal (or plant) species. Toni and Andrew are reliable and trustworthy - I would recommend them without any hesitation. I worked closely with Andrew managing a construction project in central London for two years. Andrew is professional, intelligent, friendly and sociable. His work was well organized and well presented, and Andrew was always diligent and meticulous. I know Andrew's daughter trained as a vet and Andrew kept livestock whilst living in the UK.